→ This work "Clouds machine" imitates nature. The music also imitates nature through the use of recordings from the exhibition space, but also an imitation which evokes associations and concrete feelings in our subconscious. It is a music immersed void, an openness which invites recollection within the memory of the individual. In this work no one can touch the clouds, even as it exists as a tangible substance before us. The cloud is a metaphor for dream. 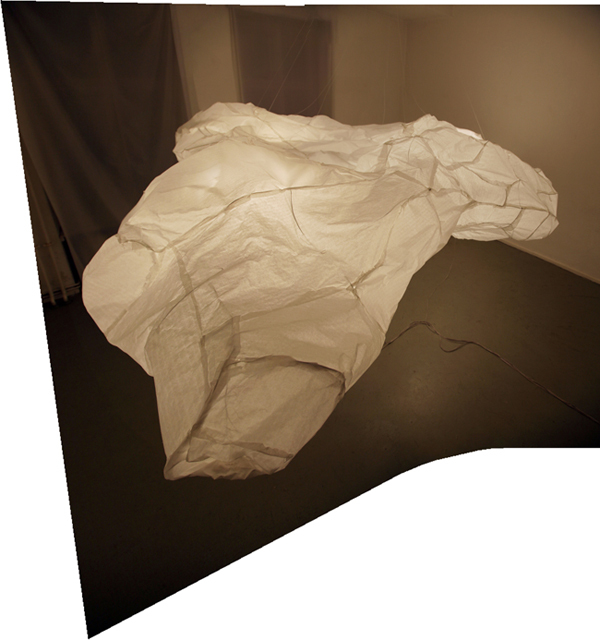 People try to look inside the cloud machines, but they cannot see what happens inside this paper structure, although the movement of shadow implies certain actions. Through the compression and expansion of the cloud, vibrations are created, transforming the cloud into a musical instrument. As the motors turn, increasing the tension of the paper and wire structure, acoustic sounds emerge. Using the physical characteristics of the clouds and room acoustics as the basis for resonation, excitation and synthesis, each cloud has different type of temper and color of sound. It is this drawing out of the cloud’s inner emergent sound which is the power of this piece.